Mining companies are spending on exploration again as interest in base metals and niche battery ingredients rebounds. Many companies are set to launch or resume drill programmes. Exploration spending could increase by as much as 20% in 2019. Gold leads the way followed by copper, nickel, and zinc. Exploration for battery ingredients lithium and cobalt surged at smaller mining companies. Spending on lithium projects doubled, while expenditure on cobalt exploration quadrupled. Africa Mining IQ provides a continuously updated online mining intelligence service providing up-to-date mining developments and current mine owner, engineer and supplier contact details on over 1 900 African mining projects. We are the perfect partner and information source for mining exploration in Africa. If you are serious about growing your business within the mining industry, it’s time you contact AMIQ. The mineral industry of Africa is the largest mineral industries in the world. Africa’s rocks span the earth’s geological history. Africa hosts enormous mineral wealth that has remained relatively underexplored. Now, new technologies for exploration and extraction, as well as modern data processing techniques, could change all that. Africa is richly endowed with mineral reserves and ranks first or second for bauxite, cobalt, diamonds, phosphate rocks, platinum-group metals (PGM), vermiculite and zirconium. For many African countries, mineral exploration and production constitute significant parts of their economies and remain keys to economic growth. Gold mining is Africa's main mining resource. 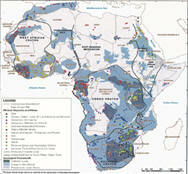 he natural resources in Africa are used practically in many industries and in many countries. Industries include manufacturing, industrial, and energy, medical and infrastructure development. Metals exported from Africa include uranium, platinum, nickel, bauxite and cobalt. Two of the most profitable mineral exports are gold and diamonds. Large parts of Africa have remained relatively inaccessible for exploration companies. There have been major developments in the ability to collect and process information, and the sensitivity and efficiency of geochemical and geophysical tools has been greatly improved. AMIQ is an online mining intelligence portal that provides accurate, reliable and relevant mining project information for organisations aiming to develop their business growth in the mining industry. The latest intelligence on mining projects in Africa including project scope, start and end dates, capital value, precise location, mine owners, project engineers and suppliers. Search projects via region, country, phase or mineral and view commentary detailing each project's history. Information on all stages of mining projects' lifecycles is provided for investors, suppliers and companies targeting the mining sector. Statistics from graphs, charts and analysis reports included. Do you supply services to the mining industry? Drilling companies, surveyors, engineers, testing labs, beneficiation plants, capital equipment suppliers, logistics, process automation suppliers and more, use AMIQ to grow their business in Africa’s mining projects. The needs of a mine are many and varied. Know where to invest your sales efforts and resources with critical insight into what’s happening in Africa’s vast mining industry. AMIQ is a lead generation platform! Be listed as a project supplier on the database, with key contact information. 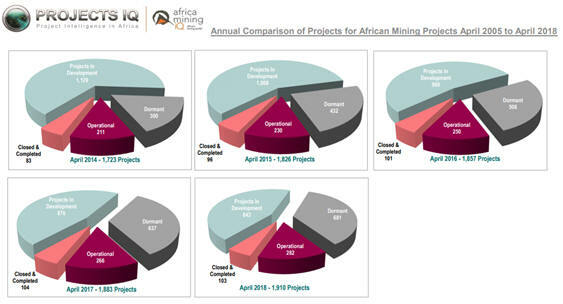 Africa Mining IQ assembles a complete list of projects around the complete life of mine cycle. Now, finding relevant, new mining-related projects within your business’ scope is simple. Being in the know in the early stages of project development, with key contacts to mine owner, project engineer & EPCM level, allows you to build relationships and position yourself early for a successful bid. With an AMIQ subscription, you can! Africa has amazing potential for mining. The coming decades are going to be very exciting! Ruighoek Mine (South Africa): This project has a capital value of over R 40 billion. A refurbishment of an older mine, it’s expected to produce 150 000 to 200 000 tons of chrome per year. It is located north of Rustenburg in the North West Province of South Africa. Kinsevere Mine (DRC): This copper mine has a capital value of over R 30 billion. It is an open-pit mine that has a current Life of Mine expected to run until 2024. It uses conventional solvent extraction / electrowinning in the copper mining process. Liganga Iron Ore Project (Tanzania): The Liganga Iron Ore Project, located near the City of Njonbe, commenced production in late 2016. Tanzania is the continent’s third largest producer of iron ore – which is a R 17 billion+ project incorporating the Mchuchuma coal mining project. Glenover Project (South Africa): This exciting project, in the Limpopo Province of South Africa, is an exploration of the rare earth minerals potential of pit material and surface stockpiles that were accrued during phosphate-based mining operations from 1963 to 1984. *Acknowledgements to Moody’s as reported in BusinessLive and BMI Research. Some of the information contained in this article is sourced from BMI Research executive summaries and from BusinessLive. Partner with the leaders in mining in Africa intelligence! Call us on +27 11 830 2132 or click here to send us an enquiry. This is just a selection of the minerals that comprise our mining in Africa intelligence database. All mining in Africa intelligence is subject to a stringent quality control process. Only once information is evaluated and approved, does Africa Mining IQ make it available to its subscribers. Africa Mining IQ is used by over 170 mining companies globally as a reputable and comprehensive mining in Africa intelligence database that stretches from specific details of mining companies in Africa to details on small and large mining projects throughout Africa. With a subscription to Africa Mining IQ, a wealth of knowledge is available at a mere click of a button. Through this unique offering on mining in Africa, you can select and track key African mining projects to follow Identify any new or potential mining in Africa projects across various stages of development – from pre-feasibility to completion. Gain access to mining in Africa's largest online database with a subscription to Africa Mining IQ today! Call us on +27 11 830 2132 or send us an enquiry.